Destruction caused by war is fascinating, but what if Mother Nature caused it instead? These are all things that videogames are synonymous with, so much so that brown and grey textures, muddy environments and charred ruins are, perhaps brazenly, more common than colour itself. But most of the time this significant imagery -- the “Destroyed Beauty” of Gears Of War; the apocalyptic ruins of Washington D.C. in Fallout 3 -- is the result of war, the remnants of the past now nothing more than ruins. Why is this? 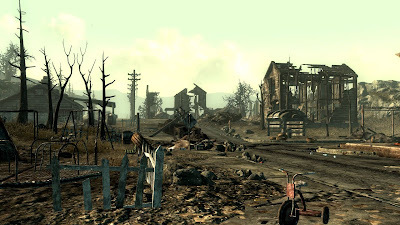 Obviously war and combat are important from a gameplay point of view, justifying these settings, but what if there could be other causes behind the destruction? What if the perdition came not from humanity’s struggle or fight against an enemy but from something out of our control? What if Mother Nature was responsible instead? This is something I have been considering for a while now and something that I’m reminded of every time another game with an environment impacted by disaster comes along or, this year, another tragedy in real life occurs. In fact, this year’s sheer quantity of natural disasters has been so significant that I have felt compelled to delay this post out of respect for those who have suffered from them or, worse, lost their lives. The floods and cyclone in Queensland; the Earthquake in Christchurch, New Zealand; Tsunami (and subsequent nuclear disaster) in Japan; floods in Brazil; the Californian fires or, indeed, the recent tornadoes in America, including the recent one which wiped portions of the city of Joplin off the map -- all of these and more have been exceptionally serious, extremely unfortunate events that, when combined, make this year absolutely horrific and inherently depressing. I put off this post because I felt uncomfortable publishing it -- much like the creators behind those games that were either delayed or cancelled, I imagine -- when so many things were happening and where so many people were being affected. But I can’t put it off forever and, forgetting the tragic brutality we’ve seen so far this year, for a moment at least, I think that natural disasters in videogames could be something important and definitely an area worth exploring. Allow me to explain. Videogame spaces, in this generation in particular, have come alive, with thematic settings, incredible atmosphere and multiple stories to tell. Discovery has been particularly strong, finding an abandoned shack in Fallout or a messy room in BioShock an intriguing affair, both because it gets us, as players, asking questions -- why is this room like this? What happened here? Where did the owners of this shack go? -- and because it adds weight and meaning to the environment we are exploring, the locations we get to inhabit. More than any other generation the combination of visuals, sound and atmosphere allow for videogames to take us anywhere, to places we can’t go. Mass Effect enables us to travel the galaxy and mingle with other species; L.A. Noire and Mafia II take us back to a time period long ago and incredibly different to our own today. Red Dead Redemption, finally, showed us what it was like to exist in a Western setting, enlightening us, indirectly, to how things were back then and how far humanity has come. But all of these settings, all of these locations that games allow us to visit -- both ‘real’ and fictional -- are static, mostly unchanging environments, only alive when our consoles are on and only existing to serve a story, mechanics or a particular intended experience. Rapture is, bless its soul, already in ruins when we get to see it, the levels built to convey the narrative and service the combat dynamics rather than to demonstrate how things can change, how characters and civilians alike can leave their mark or have an impact on the city or proceedings. If something changes it is because it was supposed to, a scripted moment to benefit or influence a particular facet of the overall experience. A good example of this is Mafia II’s transition from Winter to Spring: snow and blustery conditions give Empire Bay one kind of atmosphere (which, I might add, is quite charming) while the brighter, more positive aura of a warmer season gives the city another. What if this changed? What if Mother Nature’s ferocious but beautiful power -- if weather -- changed an environment or setting in a meaningful way? What if a tragedy in a virtual world could impact gameplay, the story, or the demeanor of a game’s characters in really interesting ways, changing our experience in the process and reinforcing our connection to that world and everything in it? 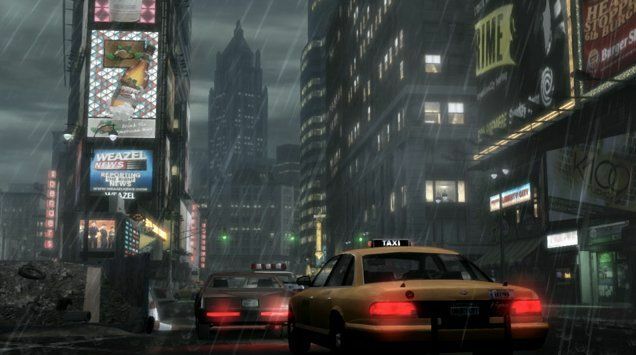 Just imagine if rain flooded Liberty City, and just what that could mean. We’ve already seen how a thunderstorm in Red Dead Redemption or showers in Liberty City can change their respective games, even if it’s momentarily. It changes the atmosphere, makes driving (for example) harder because things are slippery, and breaks up the pace and alters the dynamics of our session. But what if Liberty City was flooded, its rivers overflowing and spilling onto the roads? What if the weather was so ubiquitous and ongoing that the streets were covered with water, buildings inundated and the result was a different city -- even if it did eventually recede -- than the one we’re already accustomed to? It would force us to reassess our approach to what we were doing or how we’d do it, and test our knowledge of the space we have inhabited for so long, making us find alternative routes or different means of travel. Furthermore, narratively, it could affect the people who we come to know, showing us sides of their personality we couldn’t see previously and how they would deal with such adversity. What if these quest-givers -- because, let’s face it, that’s all they really are -- couldn’t offer us things to do or tasks to perform because they simply had more important things to attend to? What if, god forbid, these characters -- some of whom we might actually have a connection to or relationship with -- died because they weren’t prepared for an excess of water to come and flood their houses, their home? What if, to go in a slightly different direction, Liberty City was hit by an earthquake, unexpectedly, because like the weather it was dynamic, unpredictable and unforeseen? Such scenarios can pose many questions and, if done effectively, really impact upon a game world and the things inside it in meaningful ways. Part of the reason Heavy Rain resonated so much with me is because it used rain as a significant, serious part of its narrative -- something that hadn’t been done before. From a technical standpoint serious events and tragedies in games might be unrealistic to do, but surely there is incentive in trying if it can add weight to a world, make our connection to it as players more meaningful, and ultimately ensure that games as a whole can be as deep, emotional and affecting as products in other mediums? Mother Nature’s fury in real life is nothing more than a negative, unfortunate and unpredictable series of events, where loss is prevalent everywhere and the need to rebuild is essential. But in a virtual sense her wrath could be absolutely beautiful, especially if it engrosses us into our games more thoroughly than ever before. The result might not be pretty but it sure beats having yet another war be the justification for why all of our games are always... well, in ruins. This got me thinking about a handful of games that are set against the backdrop of natural disasters. Infamous 2's setting of New Marais immediately comes to mind, being obviously modeled on a post-hurricane Katrina New Orleans. I guess you could usher the Left 4 Dead series under the natural disaster umbrella. The games have a neatly understated back story that slowly reveals itself within the environments you explore, as well as the scrawled messages left by other survivors in the various safe houses. I'm sure there are others I'm overlooking, although it should be pointed out that in all these cases the disasters are largely cosmetic and tend to form an aesthetic backdrop rather than inform the game's mechanics or effect the player's choices. Mark -- It was Motorstorm Apocalypse that inspired the post (and, obviously, all the real life disasters this year), so there are games that deal with the subject matter. As you say, though, the majority of it is for aesthetic reasons only and those that might go beyond that (Disaster Report, perhaps?) are mostly obscure games no one has heard (or don't care) about. As the post might suggest, I'd like to see this change, not just because I'm a fan of Mother Nature's beauty, but because I think it could make for some really interesting game scenarios -- particulary now that spaces, as a whole, have become so important to the experience. ROBLOX is driven by an ever growing player base of more than 300,000 creators who generate an infinite variety of highly immersive experiences. These experiences range from 3D games and competitions, to interactive adventures where players can take on new identities to discover what it would be like to be a dinosaur, a miner working a mine or an astronaut on a space exploration.